A black and white photograph showing an overall view of the construction of the sewage treatment plant at 500 Victoria Street East. The sewage plant is located on the north side of Victoria Street, east of the CN railway crossing. This sewage plant was built in 1948. The original plant was built in 1915. 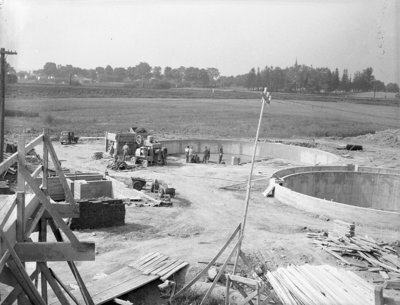 Construction of Sewage Treatment Plant, 1948, Marjorie Ruddy, Whitby Archives, 08-006-055.